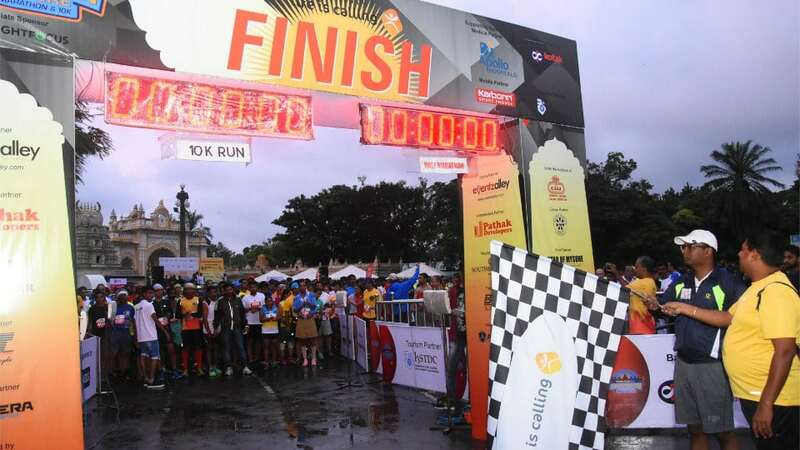 Mysuru: The 7th edition of Celebration Mysore Marathon was organised by ‘Life is Calling’ in city this morning. 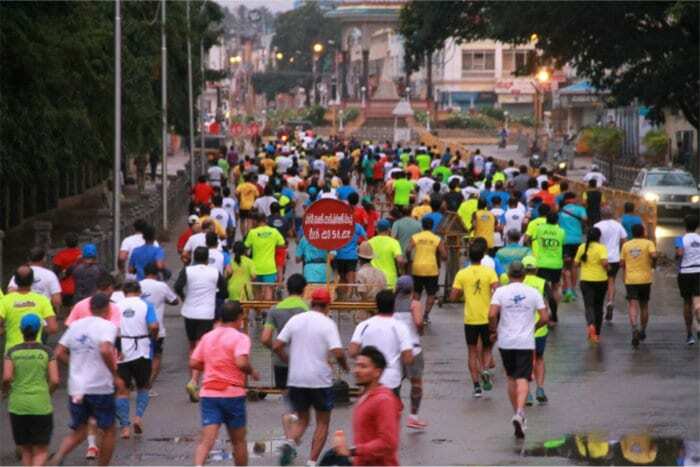 Braving the early morning drizzle, about 3,000 enthusiasts from various parts of the country participated in the event which commenced at 6 am in front of Kote Anjaneyaswamy Temple, Palace North Gate, here. 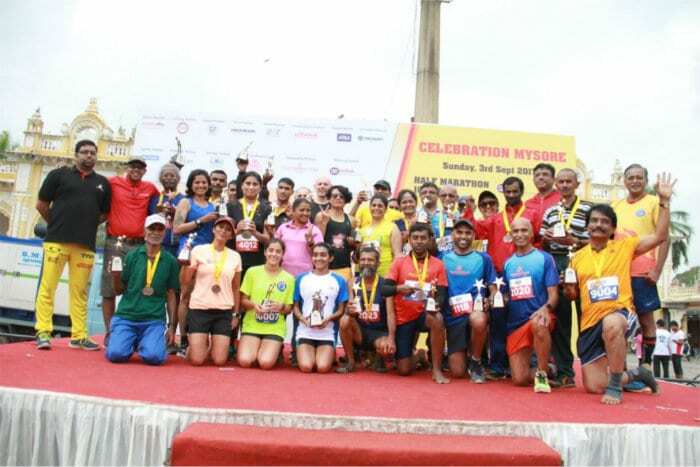 The half-marathon and 10 km run under the competitive categories for those in the age group of above 16 years was flagged off by DC D. Randeep who also ran for a short distance. The 6 km run or walk non-competitive category for participants above 10 years was flagged off by members of Bijapur Bulls Cricket team of KPL. The run traversed through Ramaswamy Circle, DC’s office and Hunsur Road to be back at the starting point and the route was suitably curtailed depending on the distance. Adequate arrangements were made to tackle medical emergencies. Police had barricaded at strategic points to regulate traffic flow and facilitate the runners. Finisher medals and certificates were distributed to all the participants. For accurate record of timing, a timing chip was tagged to the bib firmly fastened to the T-shirt of the participants. Trophies were also presented to top three winners in the half-marathon and 10 km run under the open, senior and veteran categories. Men — Open – 16 to 45 years: Sharath Kumar, Rakshith Shetty and Karthik Anand; Senior – 46 to 60 years: Ajit Thandur, K.C. Kothandapani, Sreedhara Mulagunda; Veteran – 61 years & above: Srinath Nagappa, D. Vasudeva Rao, H.V. Puttaveeraraj Urs; Women — Open – 16 to 45 years: Neera Katwal, Bhagwati, Nazia Hasan; Senior (46 to 60 years): Pushpa Rao, Sumitha Rajesh. Men — Open: Vivek Kumar, Mast Ram, Ravindra Singh; Senior: Hendrik Hardeman, T.M. Narayan, Ananda Gupta; Veteran: C. Selvaraj, B. Ramakrishna; Women — Open: Devika Srikanth, Abhigna Anand, P.S. Haritha; Senior: Usha Hegde, Yulia Ponamoreva, Amisha Wadkar; Veteran: Sharada Venkataraman, Raji Ramani Srikant.